What follows is Emilie Colombani's review of Maurice Blanchot's Chroniques littéraires du Journal des Débats avril 1941-août 1944, new from Gallimard. The French original will appear next month in Transfuge magazine. Our thanks are due to Charlotte Mandell for this translation. 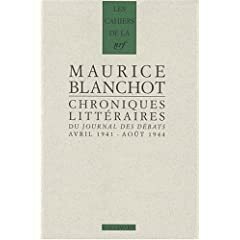 Cautious minds might be surprised at first glance to note that just a few years after Maurice Blanchot’s death, and to honor the centennial of his birth, Gallimard (under the imprint Les Cahiers de la NRF) has published a book by Blanchot that has such a "journalistic" title. Nothing could seemingly be further from a newspaper review than the work of the man who introduced us to a concern for "plain" speech, the search for the "neuter," and an obsession with purity in literature. The titles of the collections of essays by the author of The Space of Literature in fact resound in our ears like so many denials of that non-essential speech, that stream of inchoate words that in Blanchot's view, following the traces of the Mallarméan precept, are the characteristic of oral communication, a communication that will never "make up for the defects of language," whose insistent rumor journalism, especially these days, so often takes pleasure in spreading. What’s more, we know the symbolic, if not falsely polemical, quality of the dates themselves on which Blanchot published these articles, from April 1941 to August 1944. Evil dates, according to some distasteful inquisitors, who will note that the Journal des Débats was one of the publications authorized by Vichy. To those people one can only counter with the lucidity of the texts and this plea for freedom, which appears in the course of an article on Tocqueville where Blanchot exalts "the spirit of discernment during a time when the unquestioning mind was triumphing, the purely intellectual passion to know and not to be duped when enthusiasm is driving everything, even politics." How can we not see this as an indictment in miniature of the totalitarian inclinations that dominated Europe at the time? Of course we have to admit that by his deliberately "disengaged" position, hostile to any partisan spirit and to any stance that might betray his systematic mind, this close friend of Emmanuel Levinas would always remain the custodian of a distinct tradition that holds art as something that cannot be appropriated by the sirens of current events, even if they be malevolent. Some might find this displeasing, and it is true that Blanchot's aristocratic taste for shadow and secrecy may have given rise to a number of questions. But that a writer so sure of his resources could claim as his own the sole happiness of meditating on literature and "on the silence unique to it," to use the expression that figures as an epigraph in a number of the first editions of his texts, no doubt seemed too strong for some to ignore. There is however no rhetorical posturing in Blanchot, nothing even that could signal that exclusive and rather outmoded cult of "art for art’s sake." If, like Valéry’s Monsieur Teste (about which one of the most brilliant readings ever offered can be found in this collection), Blanchot is more fascinated by the workings of the mind than by its results, he is not one of those Neo-Parnassians who live idly remote from the preoccupations of the city. For him as for Sartre, although in a very different way, literature can only be a matter of "communication," yet in the noblest and strictest sense of the word. Every work forms with its audience a dialectic relationship where the distinction between essential and non-essential is never simple. The presence in this collection of a large number of texts which are actually "book reviews" in the strictest sense in that they comment on the recent publications of novels that were not necessarily destined to be epoch-making (and in fact were not) bears witness to this. Who remembers Luc Dietrich's L’Apprentissage de la ville, Julien Blanc's L'Admission, or Elisabeth Porquerol's Solitudes viriles? Authors who were obscure even in their own time and yet whose works carried within them, despite their defects and their weaknesses, the demand for literary questioning: "We cannot help but try to discover why these works, so different in method, seem to falter at the same point on the slope, and even if successful, resemble each other in their common lack of success." Adherence to this "impossible community" of minds so dear to Hölderlin, the terms of which Blanchot would revisit later on in The Book to Come and The Infinite Conversation, comes at this price, and cannot dodge the threat, consubstantial with the work, of its "disaster." We also sense, in this series of articles that follow a chronological order (which is by nature impervious to the syntheses of thought) a constant desire to submit texts and authors to an interrogation whose precise forms Blanchot does not yet grasp at that date but whose urgency he anticipates. The writer and thinker's work is present here in gestation – that taste for the margins, for the boundaries of the work established and mummified by public recognition, a mummification that keeps increasing as the recognition grows – thus his surprising pages on the Notebooks of Montesquieu (an author so long museified in those impeccable monuments that are The Spirit of Laws and Persian Letters, and in whom we had not suspected such reflexivity), or on the work of Balzac faced with the demiurgic challenge of La Comédie Humaine, or these reader’s notes full of perplexity on Chateaubriand's or Sainte-Beuve's relationship to politics, a strange and paradoxical relationship in which we might recognize, between the lines, the link both of vigilant demand and imperious rupture that Blanchot felt with his own century. For the author of The Madness of the Day was not only one of the writers who along with Kafka, Pessoa, Musil, Freud and Broch most keenly confronted European literature with the almost somnambulistic relationship it has with its founding myths, that share of essential bewitchment that still survives in the core of rational thought and its certainties. He was also one of those discreet observers who in a kind of peaceful and nostalgic shadow never stopped reminding us that literature in its infinite movement is this long waking dream that saves us from all the sleeps of reason. Great - thanks for putting this up.